Today, in a meeting with KK Yadav, Municipal Commissioner, Government Houses Residents Welfare Society Sector 22 (GH22RWS), submitted a proposal for appointment of ‘Swachhata Marshals’ from city residents. 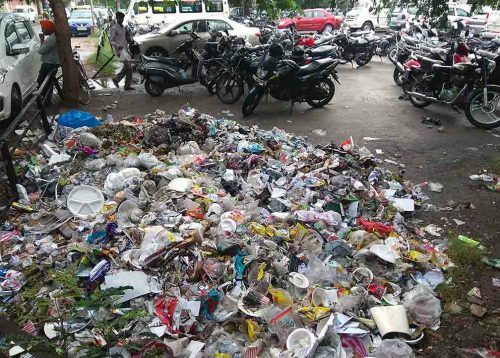 The society expressed satisfaction on the number of focused steps taken by the MCC recently for improving the cleanliness in the city particularly towards management of solid waste. Definitely all these are going to help Chandigarh rankings in Swachhata Survey-2019 and in Garbage Free Cities 7-Stars Ratings. “A good rating would be only possible with active involvement of all stakeholders comprising corporation, bulk waste generators, citizens groups, residents, MWAs and RWAs” remarked Vinod Vashisht, President of GH22RWS. · ‘Swachhata Marshals’ may be empanelled on similar lines as for ‘Traffic Marshals’, a concept being used by Chandigarh Traffic Police. · The Sanitary Inspectors to issue notices and challans on advice of Swachhata Marshals. · Senior Citizens, House Wives and Students can be roped in for empanelment for ‘Swachhata Marshalls’ on recommendations of respective registered RWAs or MWAs. · Such Marshals be paid a fixed monthly honorarium say rupees two thousands. · 1/3rd of the spot fines amount collected be used for rewards to Clean Ambassadors and Door-to-door collectors; second 1/3rd amount to be used for payment of honorariums to ‘Swachhata Marshals’ and remaining 1/3rd goes to MCC for its use in visible city beautification initiatives under the 7-Star Rating protocol requirements. · One ‘Swachhata Marshal’ for every 100 households. · All near two lakh households of the city may be covered in a phased manner. “It’s a good idea and the MC would go for it” these were the remarks of the Commissioner after going through the society’s proposal, said Vashisht. The GH22RWS delegation included Sushil Malhotra, Jagdish Lal, Rajesh Mehta, Vasudev Gupta, Shobhna Pathania, Jagroop Singh, Prem Pal Sharma, Pankaj Bhugra, Mamta Kalyan and Amit Katoch, informed Vashisht.